For over 200 Nigerian students, yesterday marked the beginning of a step into what may become a blossom basketball career.Students drawn from different schools in Lagos and Ogun State, including Julliard Academy in Magodo, Dansol High School, Agidingbi and the Nigerian Turkish International College, Isheri, were at the Teslim Balogun Stadium, Lagos for the sole aim of learning some basic techniques about the game of basketball. 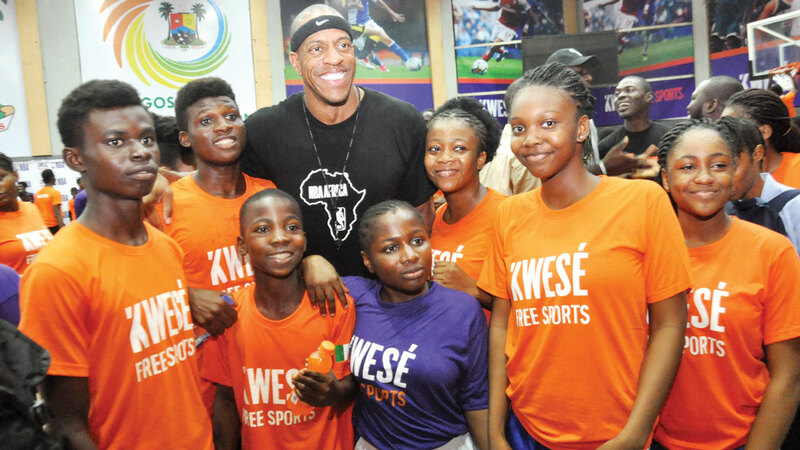 They were brought together by Africa’s largest and only pan-African free-to-air (FTA) channel, Kwesé Free Sports, for a basketball clinic under the tutelage of former NBA player, Jerome Williams. The aim of the Youth Basketball Clinic was to promote the sport and raise interest in the grassroots. It was attended by boys and girls aged between 12 and 20 years.The former NBA player, Williams, took his time to lecture the young lads some basic fundamentals in ball handling, dribbling, jump stops, passing and shooting. Williams, is an American retired professional basketball player who last featued for the New York Knicks of the NBA. He was a star player on the Magruder High School basketball team. Drafted out of Georgetown University by the Detroit Pistons with the 26th pick of the 1996 NBA Draft. He played over four years with the Pistons, becoming one of their key reserves. He was a fan favorite during his days playing for the Toronto Raptors due to his tenacious efforts on the court. Williams played in 587 games over nine seasons, averaging 6.6 points and 6.4 rebounds per game. Williams joined the NBA’s “Basketball Without Borders” program, an effort to teach the game and bring resources to underdeveloped nations in Africa, Asia and other parts of the globe. From September 26-28, 2017, Williams was in Abuja for the fourth finals of Power Forward, a youth development initiative of ExxonMobil, NBA and Africare focused on raising public health awareness among youths.At the end of the Youth Clinic yesterday at the Teslim Balogun Stadium in Lagos, Williams told The Guardian that he was excited to be chosen by Kwese Free Sports to teach young Nigerians the fundamental techniques in basketball. The students were made to go through the basic right and left-handed lay-ups as well as jump shooting fundamentals of basketball. Williams also thought them jump stops/pivots as well as ball handling/dribbling and passing. Other things the students went through were the basic fundamentals of passing as well as engagement in variety passing drills and jump shooting fundamentals of basketball. 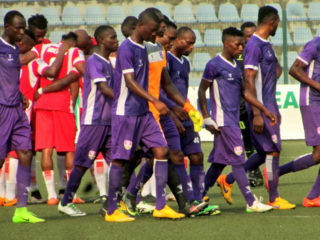 The General Manager Kwese Free TV, Chichi Nwoko, explained at the end of the exercise saying: “Kwese is committed to the development of basketball in Africa.” She also stated that Kwese Free Sports broadcasts an impressive line-up of sporting content including the NBA, Premier League, Carabao Cup, Copa Del Rey, international boxing and Formula One. 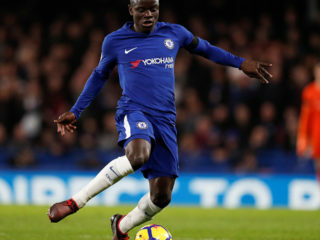 Nwoko noted that the new NBA season starts on October 17, with four live games scheduled to air on Kwese Free Sports every week, including Live prime-time match-ups for the region on NBA Sundays from the start of season. Also speaking yesterday, the Senior Manager, Basketball Operations, NBA in Africa, Guesbeogo Traore was full of praises for Kwese Free Sports for the Youth Clinic, which he said was a step the Nigerians need to become an NBA Star. Former NBA star and ex-captain of D’Tigers of Nigeria, Olumide Oyedeji, who was among top dignitaries present at the Youth Clinic yesterday commended Kwese Free Sports for giving Nigerian youths the ‘basic instruments’ they need to commence a blossom basketball career.